Kirbie Goes to Hollywood: Would you not attend someone's wedding if it was on your favorite team's game day? Would you not attend someone's wedding if it was on your favorite team's game day? Stewart, I know you're trying to reiterate your point with this article, however this didn't convince me of anything. 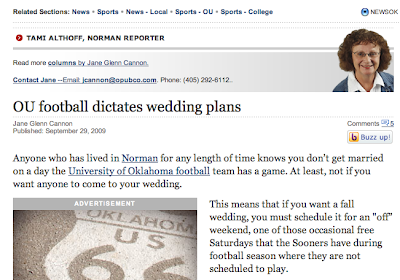 Basically you OU fans are still a bunch of crazies and if you'd seriously consider not going to a friend's (brother, sister, relative of any kind) wedding just because it's on an OU game day then I don't know what to think about that. I'm just saying a) it shouldn't matter and b) you're going to have a lot of people getting married on the same day. So, blog readers, what do you think? Acceptable to plan your wedding around a sports schedule or not? You date the person because you like them, are attracted to them, and have things in common. You get in a relationship with a person because you enjoy spending time with them and have a lot of big things (life things) in common. You are successful in that relationship when you can balance the quality time you spend together and the time you spend with each others friends, you are willing to make sacrifices for each other and you appreciate who each other are. You get married (based on perception not experience) because you love the person, you see a future with them, and they have become the best friend you can't live without. If you want to get married on gameday, just make it a road game where the ceremony won't interfere with the telecast. Also, no conference or big time non-conference matchups should coincide with a wedding due to their importance. This should be easy due to the fact that thanks to big time television, the most important games are scheduled a few years in advance...so work around it. Merch had a wedding on a gameday and it was a huge success. However, he picked Tulsa (not a major game) and allowed everyone (except those in the wedding party) to watch it before the ceremony started. Pretty much what I'm getting at is be cognisant of your decisions when it comes to your husband and particular wedding date. If he wanted to get married outdoors in January, you would definitely object, so what's the difference between that and an OU gameday? Final thing I have to add is that Oxy changed the date for their yearly Christmas party from the first weekend in December to the second because it would have been the same night as the Big XII Championship in Dallas. If a multi-billion dollar corporation can get it, so you can you. DeLyn had to change her original date for her wedding because it "absolutely couldn't be on an OU football weekend," according to my grandpa and dad. I think they ended up compromising and settled on an OU away game...seeing how they lived 20 minutes from Norman, no one with tickets would have gone!